Great customer service is hard to come by these days. When it happens, it’s worth letting everyone know about! Last year, I saw many parents wheeling a Dream Duffel at dance competitions. I thought they looked really useful, but didn’t get one. This year, Grace has 3 costume changes, accessories, etc. She is also dancing in 4 competitions, 2 recitals, and hopefully, Nationals in the summer. I decided the Dream Duffel would be the most useful thing to get to haul it all around. I had heard that January was “the” time to order one, as they usually went on sale then. The bummer thing, is that the website was all out of them every time I checked. Last week, I called to see if by any chance, I could order one over the phone. The woman told me I couldn’t order one if they were out of stock online. She did tell me that they were going to be putting a limited number on the website for order on Monday at 9:00 a.m. I put it on the calendar to go online and attempt an order then. As soon as my kids left for the bus today, I went to the Dream Duffel website again. This time, there were medium Dream Duffels available, but none in the kit with accessories. Because I have had such a hard time getting one, I went ahead and paid the extra $10 to order the duffel and accessories separately. My Mom asked me to order Grace the personalized patch with her name on it, so I put that on too. I chose to pick it up myself (since they are located less than an hour away). It also saved $25 in shipping to do it that way. A couple hours later, I called the company to see when I could pick up my order. The woman on the phone told me the times I could pick it up. I told her I had ordered a personalized patch, and asked how long it usually takes for those to be done. She said tomorrow or Wednesday, it should be ready. I asked if I could call tomorrow to see if it’s ready. I told her Grace’s birthday was tomorrow, so it would be awesome if it was ready then. She told me she would make sure it was. Then she said, “In fact, I will make sure it’s done today if you’d like to come today. I’ll go back there and make sure he does it in the next 10 minutes.” I thanked her and hung up. WOW!! Talk about some great customer service! First, she told me when I could order them, then she helped make sure I could get it on time for my daughter’s birthday tomorrow! I’m quite impressed! Another example of great customer service I heard about in regards to the Dream Duffel, came from another dance mom/instructor at our studio. The clothes rack on her duffel broke, she called for a replacement, and it arrived the next day! These guys are amazing! FYI – the woman who told me when the limited supply would be available also told me that beginning at the end of March, preorders would be available. At this point in time, they are only able to take orders for items in stock. At the end of the month, this will change. If you haven’t got a Dream Duffel yet, and want to order one, check their site at the end of the month (or call and ask when you might be able to order one). You may not have it on time for your first competition, but from what I hear, the wait is worth it! Previous Rhinestone Stars – A Step by Step Process. Next Sleepover Fun? Still impressed by them. When I opened up the Dream Duffel, the bar to hang the clothes on was missing. I called them, but they must have just left for the day. They called me back right away this morning, and apologized. They said I could come pick up the bar, or they’d send it to me. Since Grace’s b-day is today, and I wanted to have it all set up when she gets home from school, I went and got it. When I got there, they told me they had found one on the floor last night, but didn’t know which bag it had fallen out of. They apologized again, and gave me the bar (also showed me how to snap it into place). Keep up the great work, ladies!! I love the dream duffel ! Sadly my daughter is leaving dance and joining gymnastics so I have a new large dream duffel for sale. We are in Michigan and if anyone is interested please email me at angiesmith33@comcast.net . We really do apologize. You definitely are a valued customer, but it is just not cost effective to send a new duffel out and have to have you send that one back. This minor defect will not effect the function of your duffel. You are welocome to send the duffel back and we will give you a complete refund. It is not a defect, it is ripped! How can I be a valued customer if they are more concerned about their shipping charges? I guess I was correct in my original feeling that I was not getting a new bag to replace new one that I purchased and received damaged, and completely wrong about Dancer’s Dream & dream duffel.com, THEY CARE MORE ABOUT THEIR BOTTOM LINE THAN A HAPPY CUSTOMER THAT ONLY ASKED FOR WHAT THEY HAD PURCHASED…A NEW BAG NOT A FACTORY SECOND!!!! Thank you for reading, and commenting on my post. I’m sorry you had such a negative experience with your Dream Duffel. I guess I am lucky in that I live just under an hour away, and I did not have to pay shipping. Instead, I just picked it up. I agree that receiving a ripped bag is not acceptable. They should have replaced it for you. What ended up happening in the end with yours?? The zipper on the thermal pocket of my daughter’s duffel broke after the 3rd competition. I was told I could bring it in, and they would “look at it” with no guarantee it could be fixed. With the dance season, and my crazy-busy schedule, I never made it back in to their office. When customers are paying as much as we do for our duffels, we should get good quality products. I have had a few dance moms talk about problems with their bars too. I have not had issues with mine since picking up the one that was missing in the first place. I do hope that as they grow, they also improve the quality of their products (reinforce the zippers better, more durable clothing rack bars, etc). 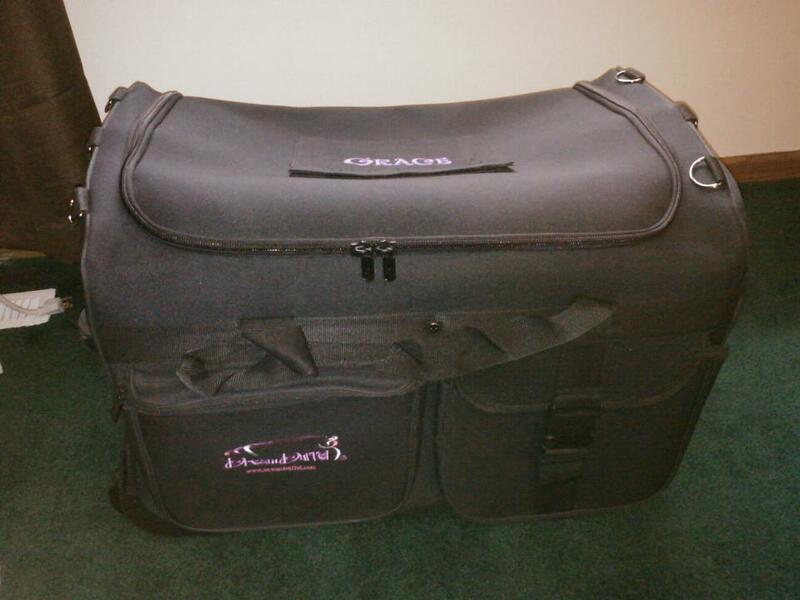 All that being said, I still love the Dream Duffel, and will continue to recommend them to dance moms. The duffel is truly the easiest way to carry all of our dance supplies, costumes, shoes, blankets, and everything else we need to bring to competitions. It all fits in one place, has a pocket for the stool, telescoping handle and wheels… still love it all! I hope your issue ends up resolved in a way that is satisfactory.